The Great Boiling Spring (GBS) geothermal system is located in the northwestern Great Basin near the town of Gerlach, Nevada. Geothermal activity is driven by deep circulation of meteoric water, which rises along range-front faults at temperatures up to 96 ºC. 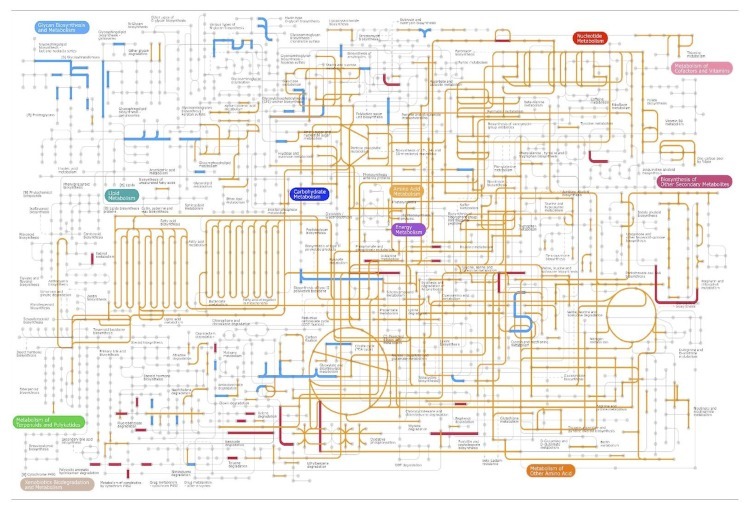 A considerable volume of geomicrobiology research has been conducted in the GBS system, including coordinated cultivation-independent microbiology and geochemistry studies [1-4], habitat niche modeling , thermodynamic modeling [1,5], microbial cultivation and physiology [6,7], and integrated studies of the nitrogen biogeochemical cycle (N-cycle [5,6,8]). The latter group of studies is arguably the most detailed body of work on the N-cycle in any geothermal system. Those studies revealed a dissimilatory N-cycle based on oxidation and subsequent denitrification of ammonia supplied in the geothermal source water. In high temperature sources such as GBS and Sandy’s Spring West (SSW), ammonia oxidation occurs at temperatures up to at least 82 ºC at rates comparable to those in nonthermal aquatic sediments . 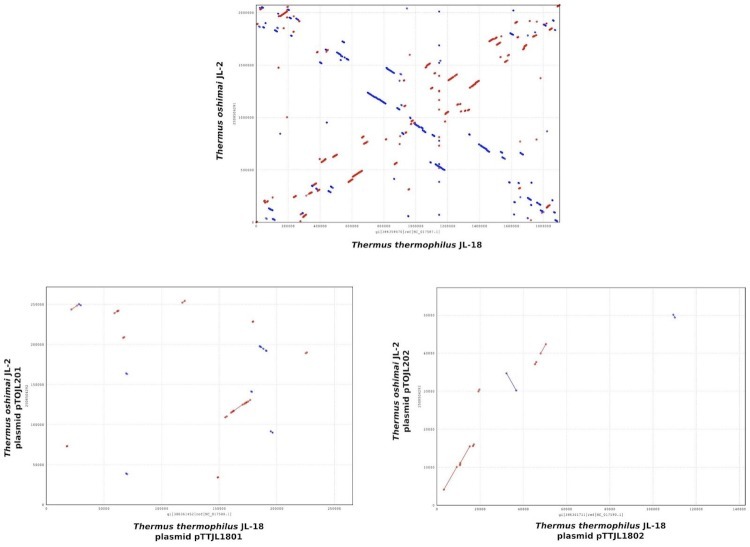 Several lines of evidence, including deep 16S rRNA gene pyrosequencing datasets and quantitative PCR, suggest ammonia oxidation is carried out by a single species of ammonia-oxidizing archaea closely related to “Candidatus Nitrosocaldus yellowstonii”, which comprises a substantial proportion of the sediment microbial community in some parts of the springs [5,9]. 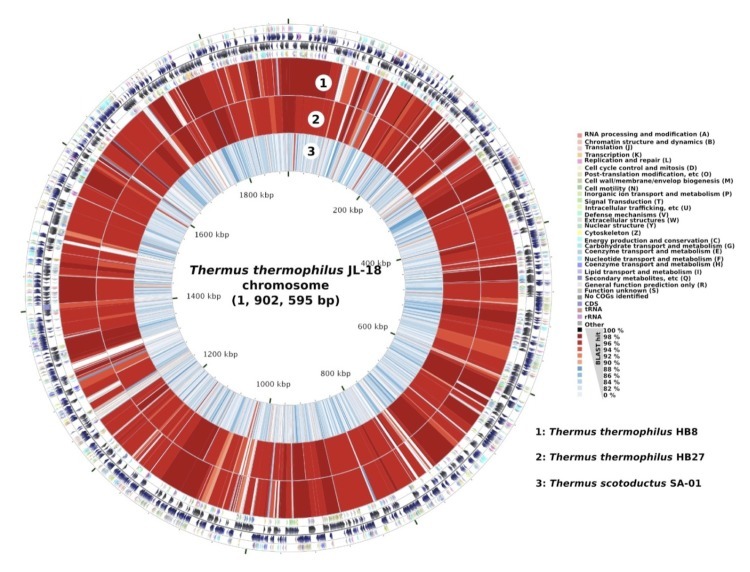 Nitrite oxidation appears to be sluggish or non-existent in the high temperature source pools since nitrite accumulates in these systems and 16S rRNA gene sequences for nitrite-oxidizing bacteria have not been detected in clone library and pyrotag censuses [1,5]. Finally, the nitrite and nitrate that are produced are denitrified in the sediments to both nitrous oxide and dinitrogen; however, a high flux of nitrous oxide, particularly in the ~80 ºC source pool of GBS, suggested the importance of incomplete denitrifiers  and electron donor stimulation experiments suggested a key role for heterotrophic denitrifiers . 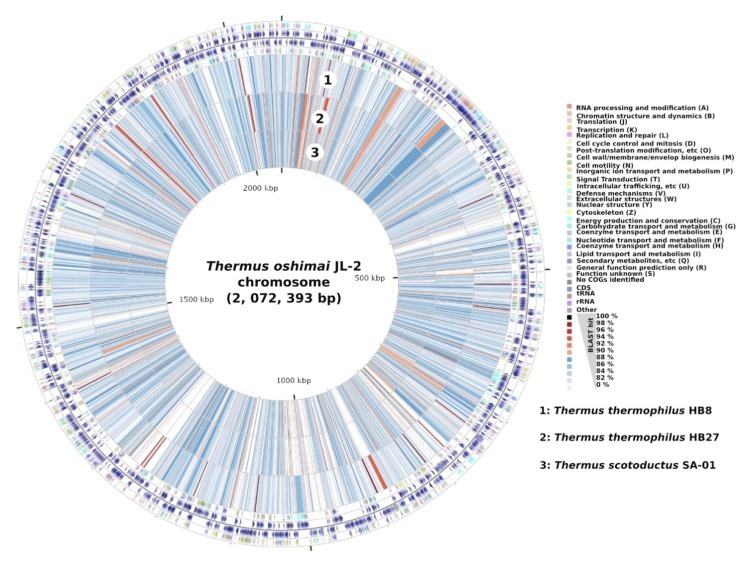 Axenic cultures of T. oshimai JL-2 and T. thermophilus JL-18 were grown aerobically on Thermus medium as described  and DNA was isolated from 0.5-1.0 g of cells using the Joint Genome Institute's (JGI) cetyltrimethyl ammonium bromide protocol . 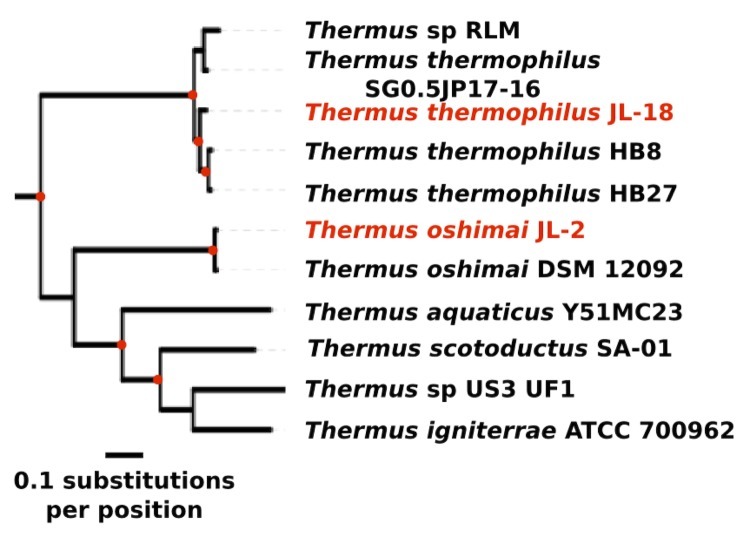 Map showing the organization of nar operon and neighboring genes involved in denitrification located on the megaplasmids of T. oshimai JL-2 (pTHEOS01) and T. thermophilusJL-18 (pTTJL1801) and the chromosome of T. scotoductus SA-01. Fe: heme protein-containing nitrite reductase, Cu: copper-containing nitrite reductase. 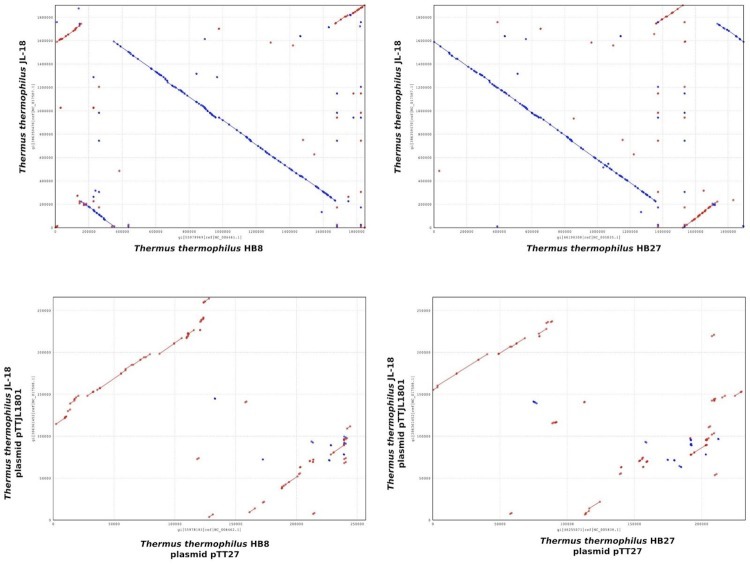 Numbers below the genes indicate the provisional ORF numbers in T. oshimai JL-2 (Theos_1057 - Theos_1036) and T. thermophilus JL-18 (TtJL18_2297 to TtJL18_2327), the locations in the megaplasmid are indicated below. nar: nitrate reductase; nir: nitrite reductase; nos: nitric oxidereductase; dnr: denitrification regulator [41-43]. Garrity GM, Holt JG. Class I. Deinococci class. nov. In: Garrity GM, Boone DR, Castenholz RW (eds), Bergey's Manual of Systematic Bacteriology, Second Edition, Volume 1, Springer, New York, 2001, p. 395. Rainey FA, da Costa MS. Order II. Thermales ord. nov. In: Garrity GM, Boone DR, Castenholz RW (eds), Bergey's Manual of Systematic Bacteriology, Second Edition, Volume 1, Springer, New York, 2001, p. 403.
da Costa MS, Rainey FA. Family I. Thermaceae fam. nov. In: Garrity GM, Boone DR, Castenholz RW (eds), Bergey's Manual of Systematic Bacteriology, Second Edition, Volume 1, Springer, New York, 2001, p. 403-404.
da Costa MS, Nobre MF, Rainey FA. Genus I. Thermus brock and freeze 1969, 295AL, emend. Nobre, Trüper, and da Costa 1996b, 605, p.404-414. In Boone, D., Castenholz, R., and Garrity, G. (ed. ), Bergey's Manual of Systematic Bacteriology, 2nd ed. Springer-Verlag, New York, N.Y; 2001. Han C, Chain P. 2006. Finishing repeat regions automatically with Dupfinisher. In Proceeding of the 2006 international conference on bioinformatics & computational biology. Hamid R. Arabnia & Homayoun Valafar (Eds), CSREA Press 2006:141-146.